I started doing an experiment today. It’s kind of working in a more efficient way. I started off with 10 one minute line drawings, just to generate a bunch of ideas. Then I took the 5 best ones and did three minute drawings for them. Then I took the top three and did 5 minute drawings for them. 2 went on to 10 minutes and I added shading. The one went on to be put in color for 15 minutes. Then I drew over it however I wanted for an hour. Since I had time left, I worked on it some more. Here’s the original one-minute sketch. 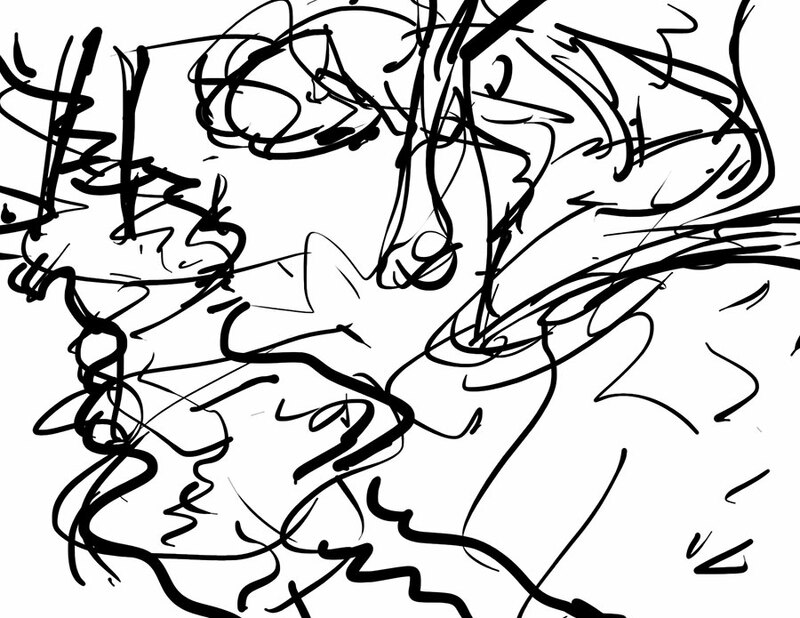 Amazingly, the kernel of the final image is really all there in the one minute drawing. I’m thinking of making a few of these, then choosing the best one to make a larger image out of. It’s working completely from the imagination, without premeditation, or references. I like the freedom of this, because I’m not restricting myself to style or subject matter. Because of the time limits, there’s a tendency so far to make somewhat cartoonish, expressive drawings, which is cool. By the way. I noticed a couple courses are using my articles as part of their curriculum. Flattered. Um, wish they’d throw me a few bones though, for making their job a little easier or more effective or colorful for their students. How about $5 in my Paypal? No. Support me on Patreon with a dollar a month? No. Never mind. I’ll just be flattered that people are teaching with my articles sometimes. Also, I started a new Facebook public page, which has like 4 likes. Pathetic. Feel free to make me look less like the least popular living artist by liking my page. Who knows what image I’ll come up with tomorrow? No me? I have no idea. Posted in art, New Series: Imagine ThatTagged #sci-fi, Adriano Costa, art, contemporary art, Expressionism, horror, painting, SurrealismBookmark the permalink. I like this drawing. The body is very free and expressive and then there is a refined focus in the eye. I see symbolic qualities in the river, perhaps looking to see where the reflection is. Thanks. Glad you like the first one in the series.